“Treasures IV: American Avant-Garde Film, 1947-1986;” Que-est-ce que c’est this avant-garde? What makes a film, or any work of art for that matter, avant-garde? Many of us do know that the literal translation of the French term means something along the lines of "ahead of its time," but very few these days will allow that, say, the great Stan Brakhage was particularly prescient about where cinema was going. Let's face a fact: for the vast majority of Americans, "avant-garde" is a synonym for "weird," and sometimes for "offensive," "blasphemous," and "a waste of taxpayer money." Possibly it's capital, or the lack thereof generated, that truly and finally defines the avant-garde. During cellist Rohan de Salam's tenure with the British improvising music group AMM, which has never made public what its name means, de Salam's colleague in the more mainstream Arditti String Quartet Irvine Arditti quipped that the letters stood for "Ain't Much Money." Avant-garde film in particular has been defined by both the paucity of the means by which a given work was created, and the small, sometimes almost entirely social means of its exhibition. In collecting avant-garde film for the purpose of (relatively) mass marketing, different concerns have taken different tacks. 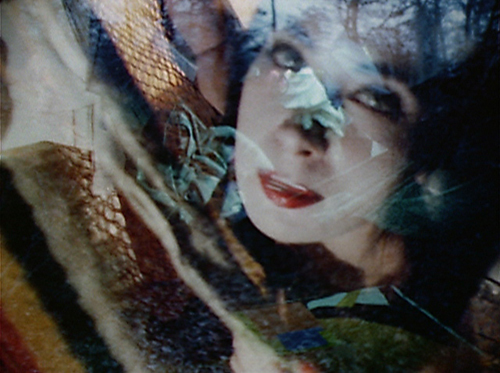 An outfit such as Kino, for instance, merely dipped into its library and came up with one set of exclusively European, largely Dada and Surrealist based material, and later, another set of works by filmmakers ranging from Markopoulos to Brakhage to Isou, with viewers largely left to connect the dots on their own. For the incredibly ambitious 2005 Image-produced box set Unseen Cinema: Early American Avant-Garde Film 1894-1941, Bruce Posner treated a different theme with each disc, from "Inverted Narratives" to "Picturing a Metropolis" and located the avant-garde within the works of such popular filmmakers as D.W. Griffith and Busby Berkeley. A new, wonderful, and, frankly, too short at about five-and-a-half hours collection from the National Film Preservation Foundation, Treasures IV; American Avant Garde FIlm 1947-1986 takes an approach that's more considered than Kino's and more conventional than Posner's. It is unabashedly curatorial, serving up material by a representative number of the "big" names in the field: Brakhage, Warhol, Cornell, Frampton, Ron Rice, Ken Jacobs, Marie Menken, and so on. On the other hand, it includes Wallace Berman's legendary one-off Aleph. It seems to emphasis the social consciousness of the avant-garde film more than prior sets did, what with the inclusion of Chick Strand's 1986 Fake Fruit Factory, a you-are-there account of the young Mexican women who work at the titular facility; Bruce Baillie's 1962 Here I Am, a moving snapshot of a school for emotionally disturbed kids; and Christopher Maclaine's 1953 worrying-about-the-bomb image-poem The End. For this viewer, the enjoyment-to-enlightenment ratio went way up on the enjoyment side with the material from what I'll probably erroneously call the New York School, beginning with Harry Smith's 1947-49 Film #3: Interwoven, a lovely barrage of shape and color that will bring to mind (for some) a less, shall we say, urbane (or is it just Canadian?) Norman McLaren. It is worth noting that Smith scores his abstractions to Dizzy Gillespie, while McLaren's Begone Dull Care, completed the same year as the Smith, uses Oscar Petersen. 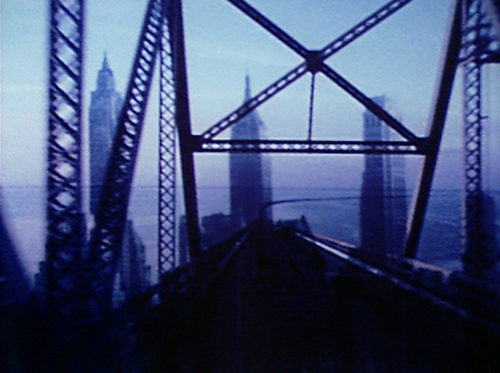 Also quite lovely is Shirley Clarke's 1958 Bridges-Go-Round, seen in the top screen grab. 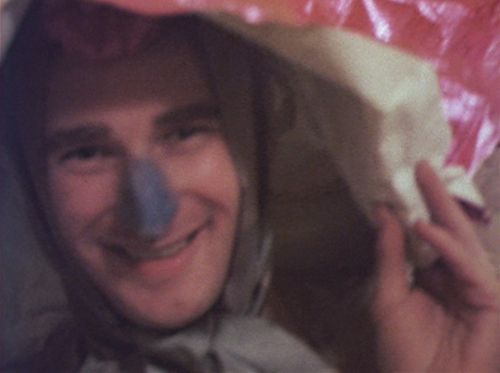 Jonas Mekas' 1966 Notes on the Circus is both a sweet piece of cinematic impressionism and a terrific time-capsule; same for Marie Menken's '62-'64 Go! Go! Go!. Ron Rice's Chumlum, above, and Ken Jacobs' Little Stabs of Happiness, below, are rather poignant reminders that the young artists of yesteryear flocked to urban areas in order to take lots of drugs and dress really funny and act goofy, as opposed to whatever the hell it is that those dullards in Joe Swanberg's films do. But seriously—such works do more than merely summon nostalgia for a bygone bohemia. They comprise a thorough-going, if not always entirely intellectually coherent, exploration of just what the film medium is for. As does, of course, the sole Stan Brakhage film of the set, The Riddle of Lumen, as earnest and unpretentious an exploration of light as you'll ever see, and a passionate argument that cinema is meant to bring light, in all its varieties, to those partaking in it. There are many more diverse wonders here, and a bit of hilarity as well—George Kuchar's magnificent I, An Actress, and Warhol's deadpan Mario Banana (No.1). And there's one outright dog, Robert Nelson and William T. Wiley's The Off-Handed Jape...And How To Pull It Off. Still, it's a useful dog, particularly in terms of the challenges, and attendant fallacies, of defining the avant garde. This short of the two filmmakers pretty much not doing much more than making goofy faces presents an "act" that would get booed off the stage at an mainstream comedy club. It is only the milieu in which the film was made and the circumstances under which it was shot that qualify it, as it were, as avant garde. In the notes for this film (the booklet that accompanies the two-disc set is excellent, by the way), Nelson is quoted as saying, "If it's truly awful, then it's just right, because that's exactly what we had in mind." Sure thing. Which is why another synonym many mainstream Americans have for avant-garde is "con game." I prefer to think of “avant garde” as exploring the edges, not necessarily those projects relegated to obscurity. It’s certainly true that most avant garde projects are made for little money and earn even less, but I don’t think that necessarily defines them. Matthew Barney, for instance, spends a small fortune on his films and installations. And plenty of avant garde pieces have gone on to enjoy immense commercial success, from 2001 and The Wild Bunch to Pulp Fiction and The Matrix. Hell, even advertising can (and frequently is) avant garde. Unfortunately, I have a limited appetite for the truly experimental. A few weeks back, I attended a rather tedious screening hosted by Mike Mills at L.A.‘s Silent Movie Theater, where he shared the first 10 minutes of a feature-length project he’s working on. Basically, it’s “E.T.” recreated as white Helvetica text on a black screen, with sentence after mild-mannered sentence describing the action from the film. An interesting experiment, I suppose, in the way Douglas Gordon’s “24 Hour Psycho” must have been (and rather surprising how easy it is to conjure up Spielberg’s visuals in your memory), but you only need a minute or two to get the picture.